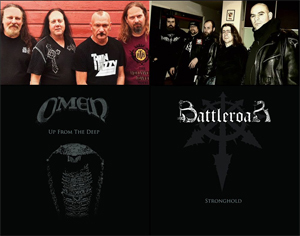 When it comes to Epic Metal, OMEN and BATTLEROAR are two names that do not need introduction. OMEN (USA) was formed by guitarist Kenny Powell in 1983, and since the release of the debut album entitled Battle Cry (on Metal Blade Records) have set the standards for the genre, while Greek BATTLEROAR, founded in 2000, are one of the most-valued and long-lasting active bands, and released 4 albums in 17 years of activity. OMEN’s "Up From The Deep" sounds as if it was taken directly from Battle Cry - war cries introduce the legendary OMEN sound, with Kenny Powell painting a majestic tapestry of guitar notes above which Kevin Goocher delivers a brazen complimentary vocal performance. BATTLEROAR’s "Stronghold" is in the same style as the fastest and heaviest songs on their last album Blood Of Legends (released on Cruz Del Sur in 2014). It shows a massive rhythmic session, great leads, and Gerrit’s classic, epic and melodic vocals. The single has been mastered by Bart Gabriel (CIRITH UNGOL, SATAN'S HOST, TITAN FORCE), and will have its official premiere at the Keep It True Festival on April 28, where OMEN will share the stage with acts such as MANILLA ROAD, CIRITH UNGOL, ATLANTEAN KODEX and others. The release will be available in only 500 copies on black vinyl, and can be pre-ordered HERE.